This Guide illustrates numerous functional expense allocations using different methods and helps you determine the program and supporting functions that an organization should present. The Guide includes discussions on several special expense accounting considerations. For example, the discussions on fund-raising costs will assist you in determining what costs should be considered fund-raising costs and the requirements for reporting fund-raising expenses, including joint activities that include a fund-raising appeal and costs of special events and other fund-raising activities. In addition, the Guide includes discussions on when fair value measurements are required in accounting for expense transactions. 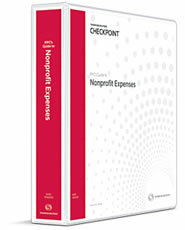 PPC's Guide to Nonprofit Expenses also includes special expense operating considerations, including discussions on the Patriot Act; prohibited transactions of donor-advised funds, supporting organizations, and private foundations; fraud; internal control; analytical procedures; budgeting; lobbying; political campaign activities; expense ratios, and benchmarking. The internal control guidance focuses on the impact of the Sarbanes-Oxley Act on nonprofit organizations, and it keeps you up-to-date on the best practices for governance and internal control that should be considered in accordance with that Act as well as other guidance issued as a result of that Act. The Guide includes 200 real-life scenarios and examples that reduce the technical language of official pronouncements to easy-to-understand advice and procedures, helping you address almost every situation you might encounter in the presentation of expenses in the financial statements of a nonprofit organization.